Long time no see. I hope you still remember my recent posting on object-oriented programming. Here is part two, which I hope you are interested in. Today, we are going to have a look at inheritance. If you do not feel familiar enough with classes and objects, please refer to my posting “A Beginner’s Guide to Object Oriented Programming (1)”. What’s inheritance got to do with programming? There is a term computer science which describes this situation: polymorphism (from Greek polymorphia, which means multiple forms). Note, that whatever role I’m currently playing I still have all the methods and attributes of a person. For example, my teacher alter ego also has a certain height, weight, and all the capabilities (methods) that any other person may have. But what characteristics and abilities are specific to a teacher? You’ll probably agree that a teacher is able to teach, and that a teacher has to teach a certain number of classes per week. In order to understand, how the situation above is being modelled in object-oriented programming we need to remember this: A class is a blueprint that can be used to build (instantiate) objects. What we are going to do now is to take this blueprint, put it on a xerox machine, and manually scribble in some features to get a new (extended) blueprint. The new blueprint now allows us to build objects that have both the inherited features and the new features. Of course, we can again make a copy of the new blueprint and add even more features. The following UML class diagram shows a Teacher class that inherits attributes and methods from a class Person. One of the benefits of inheritance is pretty obvious: Reusability, which means that you don’t have to write the same (erroneous) code multiple times. Given the fact that a person, a principal, a teacher, and a plumber eat in exactly the same way, it is enough to implement this method only once. The second benefit I’d like to mention is very similar to what’s going on in the real world. We know how to eat() and we know about the consequences of eating (some people hate ’em). 😉 However, most of us don’t have a clue about what is going on inside the eat() method. We don’t know the “guts”, so to speak. In our daily life, we appreciate objects that we can just use, without worrying about what’s going on inside. This is called Information hiding. The third major benefit is Extensibility. As I have mentioned above you can easily enhance your model by adding more subclasses, without impacting the functionality of any of the other existing classes. There are further benefits that you may discover as you gain experience in object oriented programming. Polymorphism, for example, allows you to write methods that accept objects of different types. 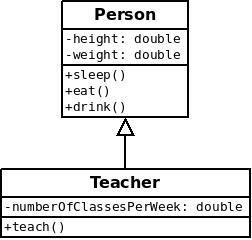 The following code in Java shows the definition of method which can be invoked by passing a person, a teacher, a principal, or anything else within the class hierarchy below Person. I hope this tiny and incomplete lesson has helped you to understand the very basics of inheritance. If you have further questions, feel free to ask me in my lectures. This entry was posted in Programming Essentials, Uncategorized and tagged inheritance, OOP, polymorphism. Bookmark the permalink.